Rochelle Intermodal | N Scale layout » Blog Archive » Railroad room update! Finally, the first sheet of plywood goes up on the wall of the Railroad room! A fairly quick process, so hope to find some time in the next week to get as much done as possible. Haven’t been able to do much the last few weeks due to the incredible amount of rain we’ve had, so nowhere to cut the wood. 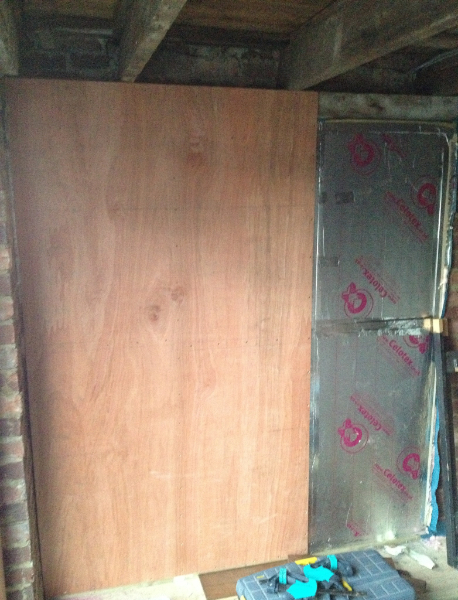 The window has been blocked up & insulation installed over that area, so it’s quite dark in there now which is a problem with these short days…can’t wait to get the walls finished so the electrician can install the lighting.